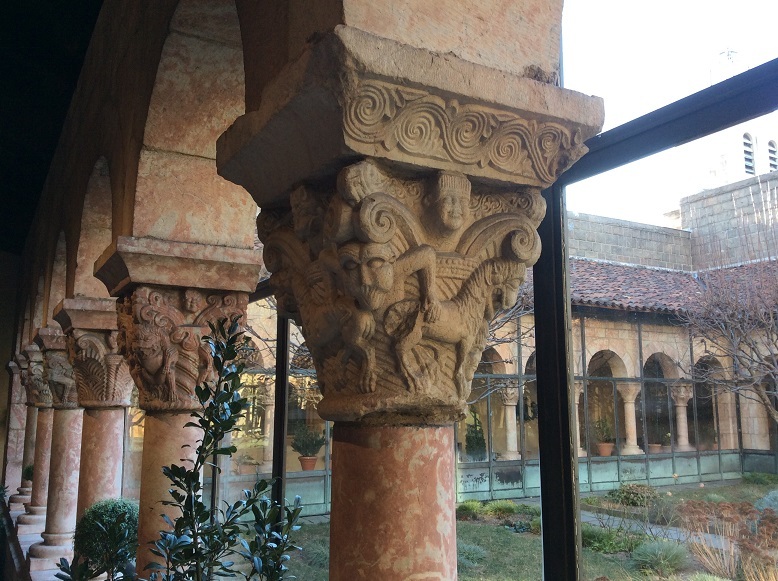 Many moons ago, back in grad school, my friend Andrea Rossi Reder told me about this wonderful museum of Medieval and Renaissance art, the Cloisters, that was constructed like a medieval cloistered monastery. It took me a few years to get there, but my husband and I visited one spring some time ago. It was a beautiful place, near Fort Tryon Park, overlooking the Hudson River. I not only enjoyed all the exquisite art and the ancient-styled construction, but loved wandering the herbal garden in the sun and warmth of spring. 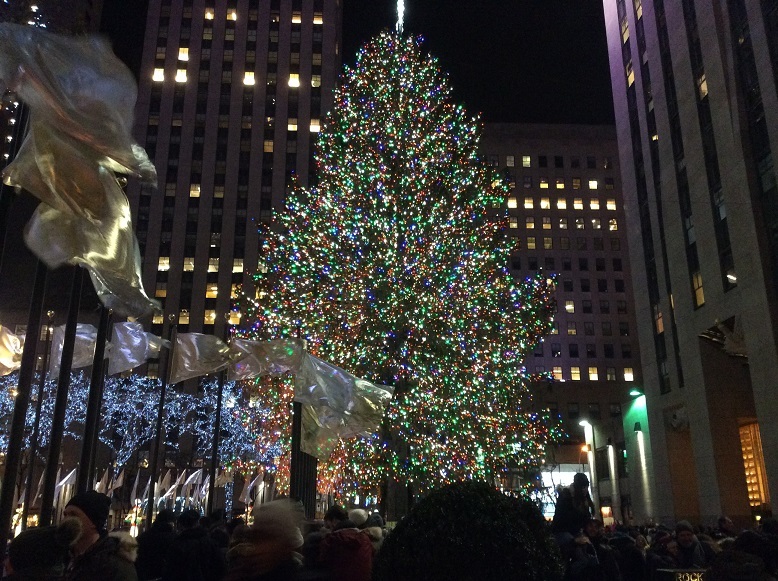 Last week, my husband proved is is indeed “goals” by taking me back there after another stretch of many years. This winter visit had charms of its own. I had forgotten just how much I enjoyed the museum. 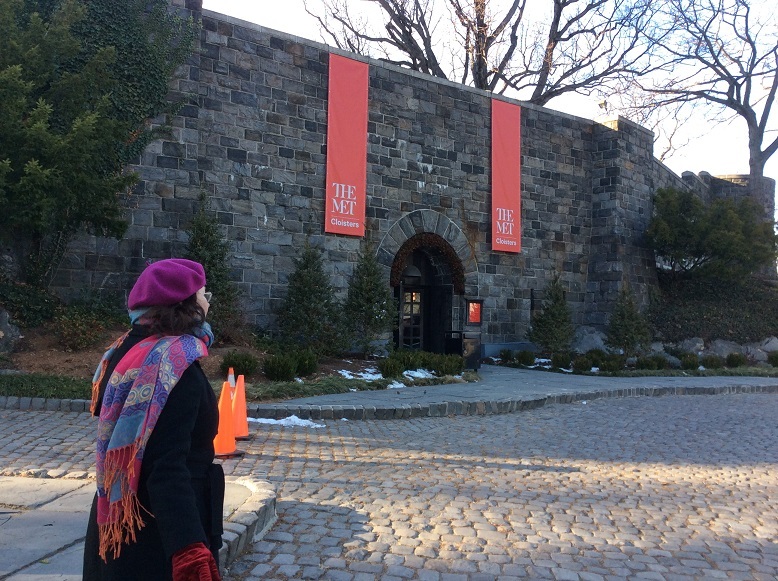 After taking the A-train from the 125th St. station, we hopped the 100 Bus to St. Nicholas Street, then another subway, and we were right outside Fort Tryon Park. Crossing the park showed us the bleak beauty of winter, the red bar berry bushes, crimson hemlock berries, and the frosty-blue berries of another type evergreen. We even got to see a fluffy, black squirrel, rare in my neck of the woods. 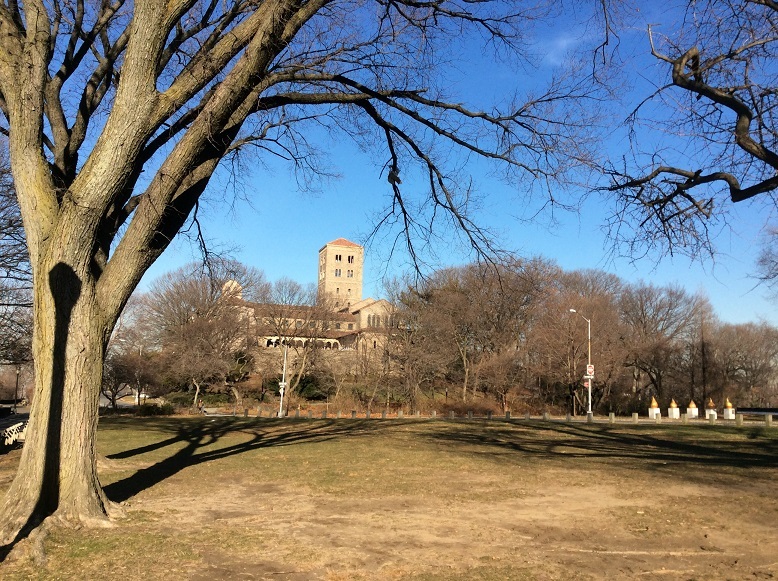 Then the Cloisters loomed through the trees against azure shading down to soft winter-blue skies . These sculpture, likely not Medieval, greeted us as we made our way up the drive. We took turns guessing what the hell they were as we approached. 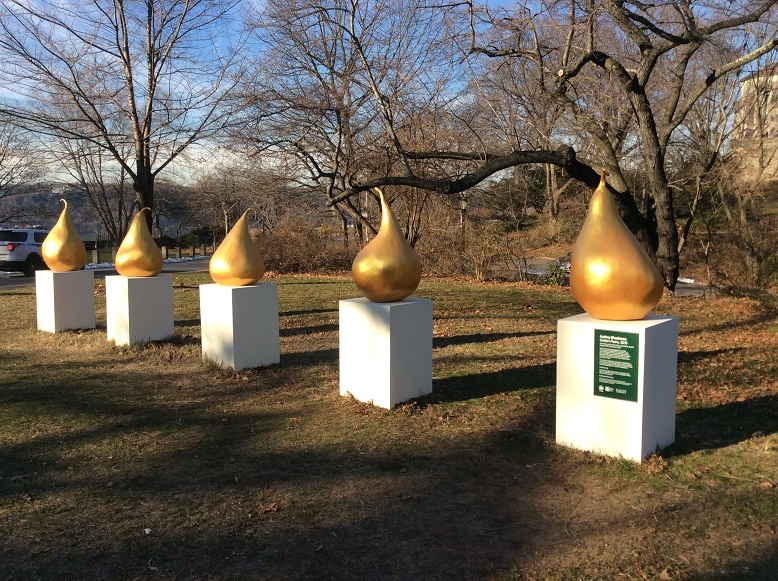 I hit the jackpot with the conjecture of, “Pears?” For once, modern sculpture stuck in the middle of nature didn’t appear so terribly intrusive. I like this shot of the arched entry way. Note the cobblestone drive way. We had to dodge a few not so Medieval buses dropping off passengers here. I’ll apologize in advance for not having pictures of Yang. We used his Ipad and I hate trying to take pictures with the darned thing. After entering and moving through the great hall, we moved off to the side to the square surrounding the cloisters garden, now closed off from us by glass – allowing us to look out at the neatly mown ghost of the summer garden, while keeping the December cold outside. During the warmer months, this area is all open. 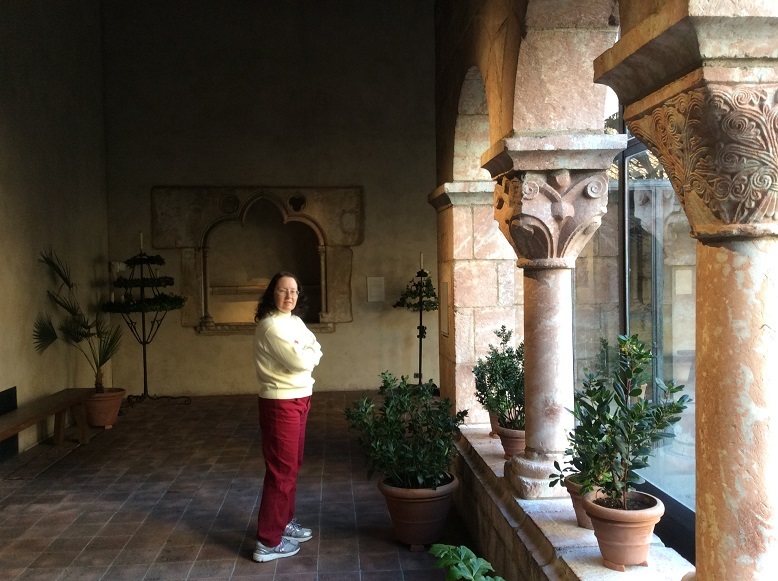 When I visited Mont St. Michel and saw their cloister garden growing within the monastery, high atop the island mountain, I realized the inspiration for the Cloisters garden. Even with winter’s hand stilling the garden, the December sunshine filled the indoor court surrounding it with brightness and beauty. The carvings on the capitals of the columns were fascinating – humans, beasts (mythological and fanciful), gods – I could swear I saw C’thullu. We went back into the building proper, then wandered from room to interconnected room, drinking in the sacred images culled from monasteries, churches, and castles – excited to find these treasures opened up to our experience, but, perhaps, a bit troubled that they had been stripped from their original homes. Still, here, they are restored, protected, and cherished. 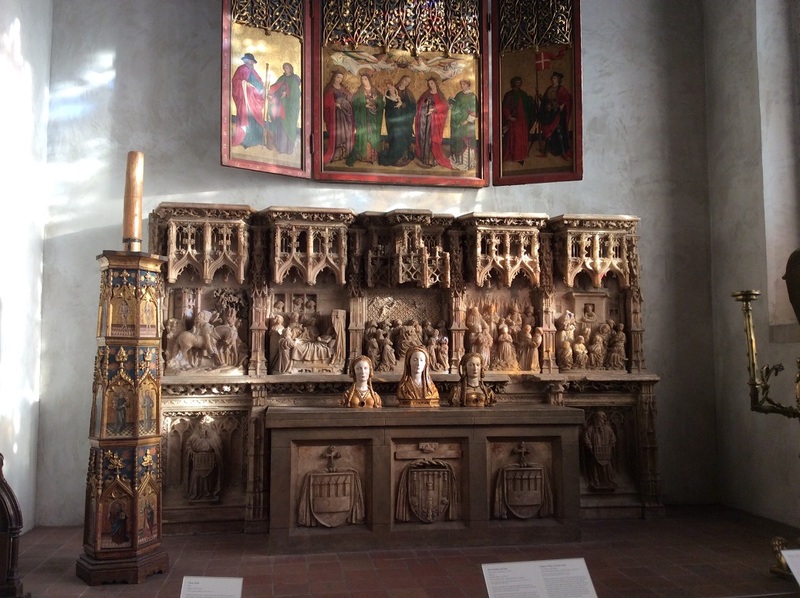 Towards the end of our meander, we came across this carved altar with the golden reliquaries of a saint and her attendants – I think St. Ursula. Female and male martyrs of the early Church were honored in stained glass, wooden statuary, and paintings. 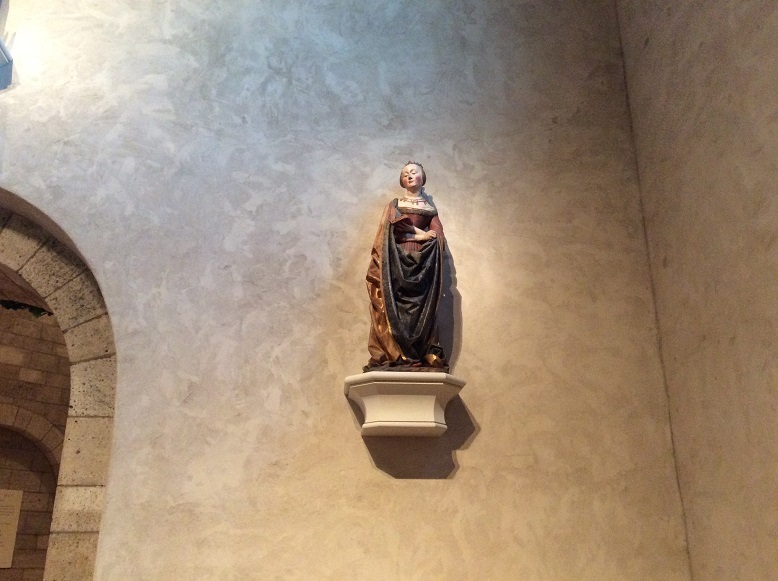 There were tons of artwork of St. Margaret. 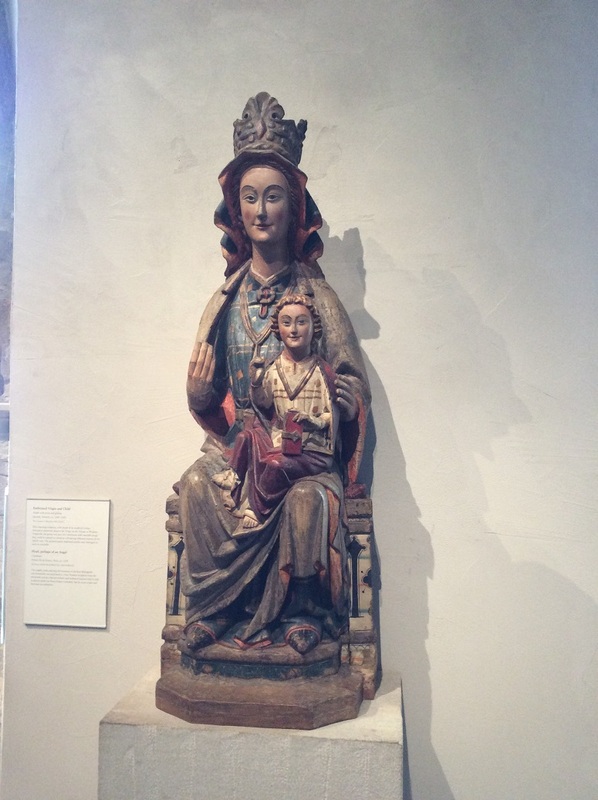 However, in honor of my BFF Barbara, I have to include this statue of St. Barbara. From the other side of the arch in the same chamber, here is one of my favorite statues of the Virgin Mary with the baby Jesus. She is clothed in the sun and stands on the crescent moon. 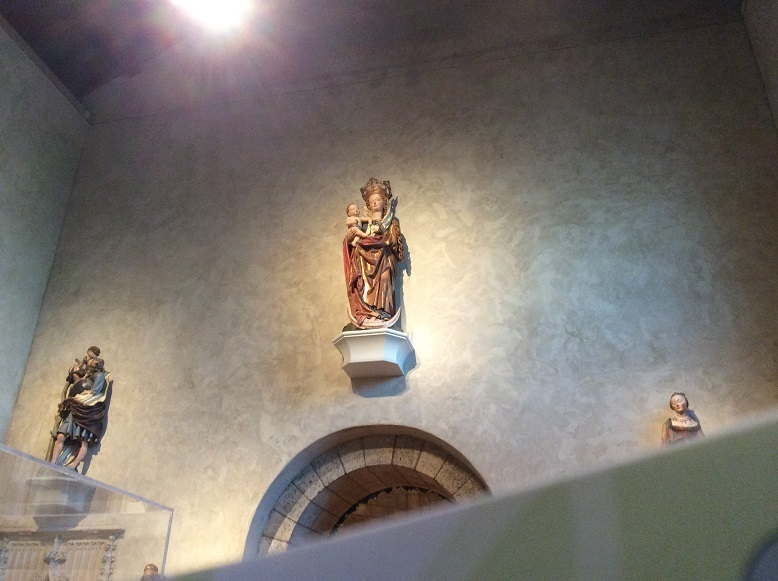 Just to the left, you can see a carving of St. Christopher bearing the child Jesus. These statues are more colorful than some of the others. I don’t remember if their paint had been restored. Most likely the case. 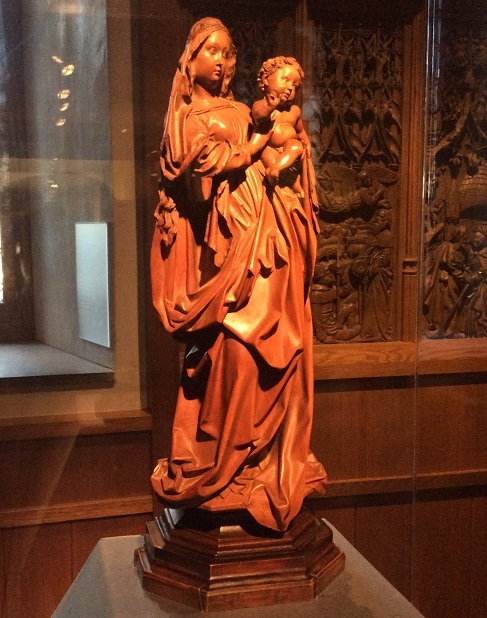 Here are some more particularly striking carvings of Virgin and Child. What must the colors have been like when this piece was even relatively new? The thought takes my breath away. If you can look closely at the folds of Mary’s robes and the strands of her hair, you’ll be filled with amazement at the workmanship. Truly, this work is a loving prayer. Similarly, look at this exquisite piece. I am amazed at the fluid drapery of the folds of her clothing, the mobile shape of her body, and the moving tenderness of her expression. The soft shining polish of this wood dissolves any impression of stiffness and immobility. The statue seems a fluid prayer of gentleness, love, and faith. What a pity the Protestant Reformation looked at these works and only saw “painted idols” instead of art’s living prayer to God. 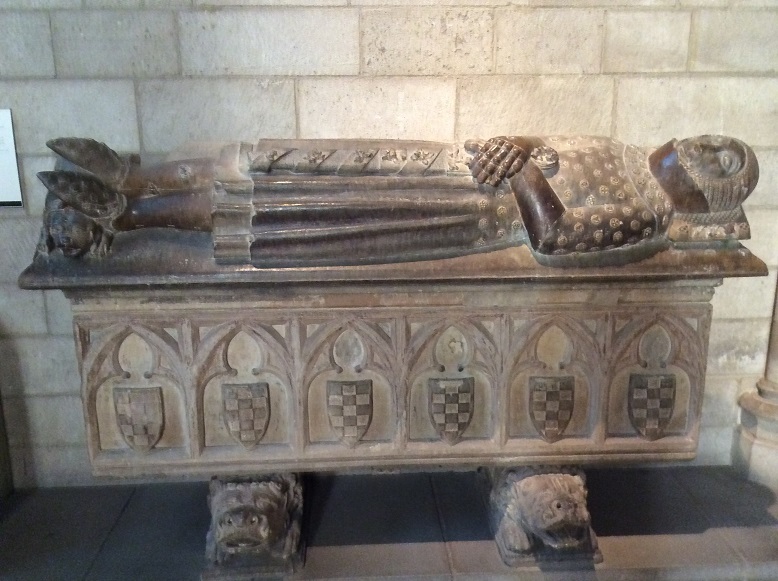 There is also a room in the lowest level, at the far end of the gallery, designed like a crypt, that displays effigies. The ceiling is shaped into beautifully vaulted Gothic arches – again, I remembered Mont St. Michel. 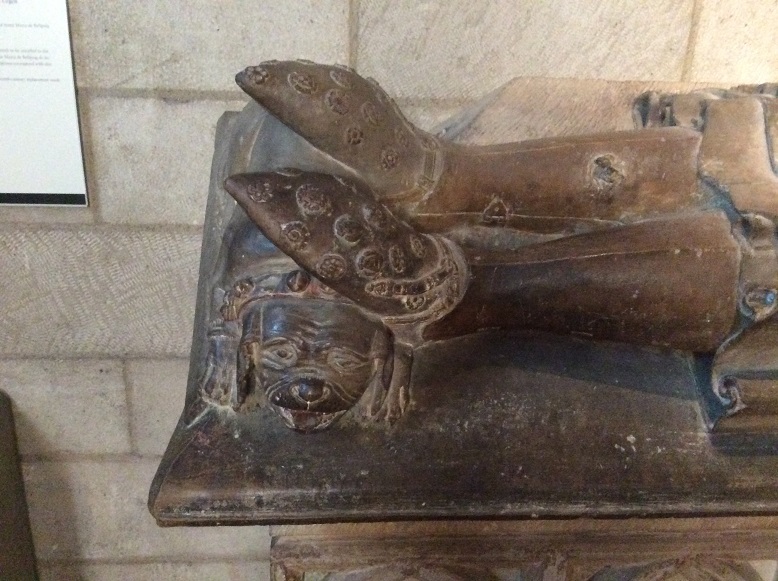 I noticed one family had a faithful dog under the feet of the various sculpted forms of generations of its nobility. The novel The Undying Monster gives an intriguing play to this custom as a hint to the UM haunting its family through innumerable generations. I guess when I go, they will have to surround me with effigies of my plethora of cats! We also made it into the unicorn room, with all the famous tapestries. I was not pleased to see so many unicorns so mistreated. No wonder they’re so hard to find nowadays – or it could have to do with the dearth of virgins. 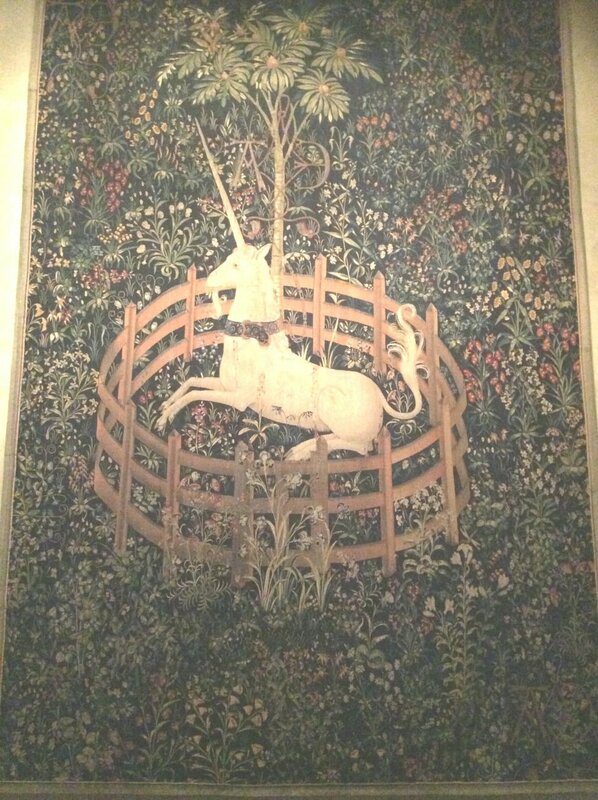 Nevertheless, I couldn’t report on a visit to the Cloisters without a picture of the most famous unicorn tapestry. There were also displays of jewelry, fine utensils, and various types of game boards. 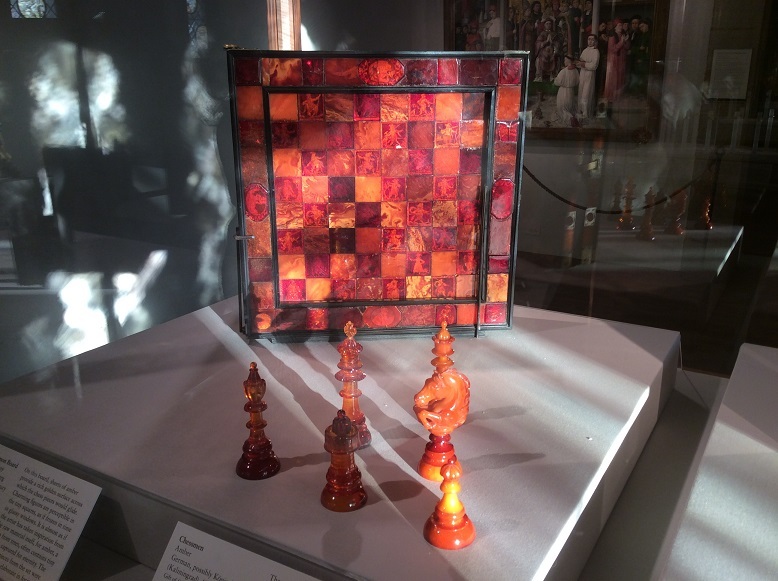 There were several chess boards with figures carved from ivory or bone (whose?! ), often with the knight displaying an accurate depiction of armor on man and horse. 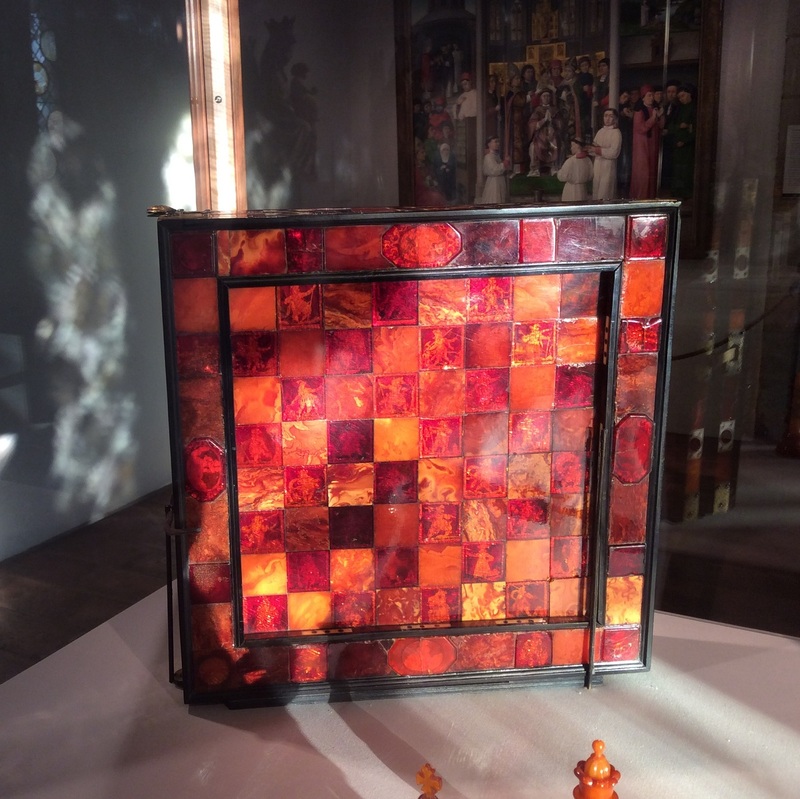 My favorite was this chess set made out of amber. If you look closely at the board, you can see pictures created in the chess squares. Of course, we also did some touristy things in town. After a wonderful dinner at Alice’s Teacup – with equally wonderful tea! 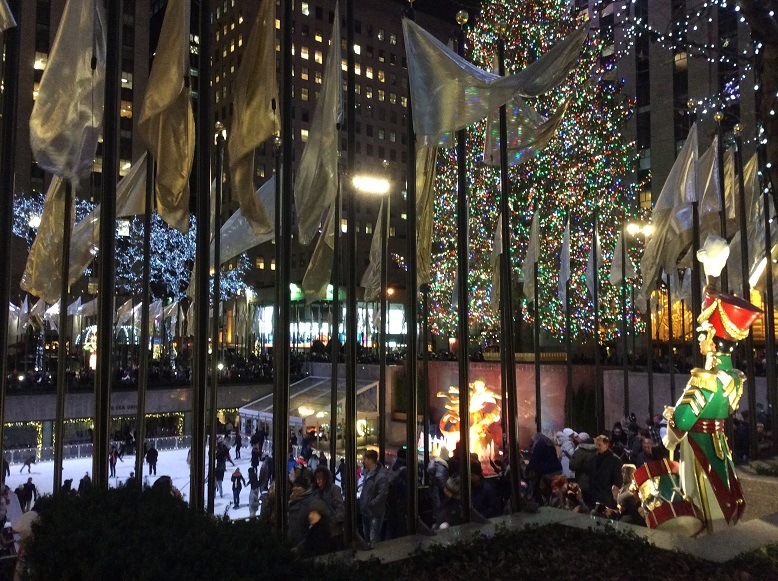 – we went to Rockefeller Center and got a look at the famous tree as well as the skating rink. So, by eight o’clock or so, we were on our train, heading back to Connecticut. Our dogs might have been barking, but we ended the day culturally and spiritually enlightened. Sue, I’m glad that you’re enjoying these reports. I think it’s fun to let people know what’s out there and to share some of the beauty that I get to see. …..because your students need you! !